Looking for the ultimate in plush, yet great performing suspensions for your Cherokee? Old Man Emu!!! With OME, ride quality improves greatly over stock and the plush ride will turn you off from lessor springs or cheap AAL (Add A Leaf) lifts from the moment you try them. The Old Man Emu springs will fit 30" tires on your XJ and with our taller rear shackles and front spacers, will fit 31" tires. And how does this lift feel? Let's just say those guys that throw $90,000 at a Range Rover are hating it compared to you! Old Man Emu suspensions cost a bit more, but its a lift that will last for many years and is world reknowned as THE best ride available. The spring rate is a very comfortable 148lbs per spring. We've run Old Man Emu springs on all our 4x4's for years. Why? Because there's no reason to settle for second best when you run a 4x4 shop!!! So we don't. OMEs have been on all our vehicles. If you're one that researches around on mailing lists and bulletin boards before purchasing, you'll notice one theme over and over. Other lifts on the market are stiff, flatten out quickly, or just don't measure up to their claims. A similar recurring theme is that you will NEVER see Old Man Emu listed in these Jeep owner's frustrated postings. Old Man Emu does more than bend a set of spring to a taller height, there's alot of engineering that goes into each spring. 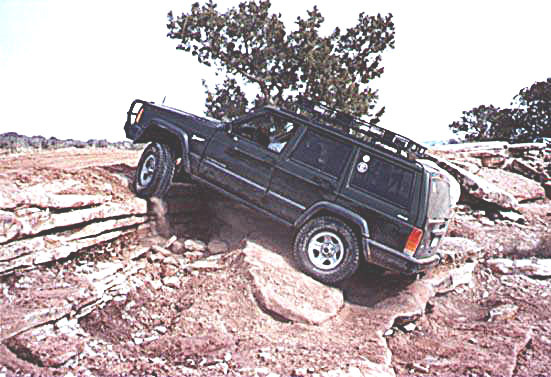 Our OME equipped XJ with Mickey Thompson tires in action on Mother-in-Law hill in Moab, Utah. Find our various Old Man Emu components and kit offerings below. To the full-blown DELUXE dream suspension upgrade which is all OME parts, along with adjustable Control Arms and Track Bar, the works!! AND the kit combines to a discount of close to $200 over buying these pieces individually! This Deluxe system will completely transform the ride quality and driving experience on and offroad for your Jeep. Want more Detail on Old Man Emu, XJ Cherokee?? OME suspensions are available only for the Cherokee, not for Comanche. If you're looking for extreme height and huge tires, this lift may not be for you. However, if you're looking for a sensible increase in ride height and substantially better on and offroad ride quality, then look no further! Among the many great benefits of the OME suspensions, the spring rate is tailored to your vehicle and taste. One spring does not fit all, and OME understands this. This is why there is a choice of springs for guys running an 8 cyl engine up front, heavy winch bar, safari rack, oversized spare tire, etc. Customize your suspension and get it right the first time! OME also builds their shocks specific to each vehicle. Its not a shock designed for a full size pickup truck that cross-references to your vehicle as well. It is built for the specific weight and suspension geometry of your vehicle for a comfortable ride on and offroad. As with the springs, various rates of dampening are also available with the OME shocks. Bushings needed (add from list above). *Please note. Items like the transfer case drop and the steering shock are not included in the suspension packages (except for DELUXE) above as they really are not a mandatory item. If you do have interest in these items though, simply add them "a la carte" to your suspension package on our Shopping Cart. Its tough to gauge the look of the lift in these action pictures. But then again, its tough to catch our OME lifted XJ standing still. 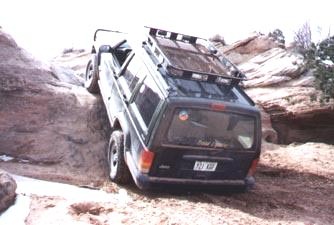 Climbing Widowmaker hill, Metal Masher Trail, Moab- circa 1997.